When was the last time you thought to yourself, “What should I post this week?” or “Do people really care about my posts?” If you’re like me, that’s a near-constant thought. There’s a difference between researching your “niche audience” and knowing for sure your research is leading you in the right direction. Luckily, you have a few free resources at your disposal that you might not be using to the fullest. Whether or not you like numbers, learn how to crunch some stats with these three analytics tools. Access Twitter analytics by logging into your Twitter account, clicking on your profile picture by the big “Tweet” button, and scrolling down to “Analytics.” There you’ll be bombarded with a lot of information. If you scroll down the main page, you’ll see snapshot insights grouped by month. You can see your top tweet of the month, your top follower, and your top mention. It also shows you how many followers you earned each month and the total number of profile visits. Use this information to help you figure out what post tactics already work for you. For example, what was that top tweet and why did so many people respond to it? To find more stats, click on the “Tweets,” “Audiences,” and “Events” tabs at the very top of the page. “Tweets” gives you a breakdown of each tweet and the accompanying stats. Take notes on which tweets get good engagement. Is it the hashtags you’re using? Is it because you’re retweeting someone else, or are people gravitating towards a specific topic? Remember to toggle this information to get a week, month, or year scope. 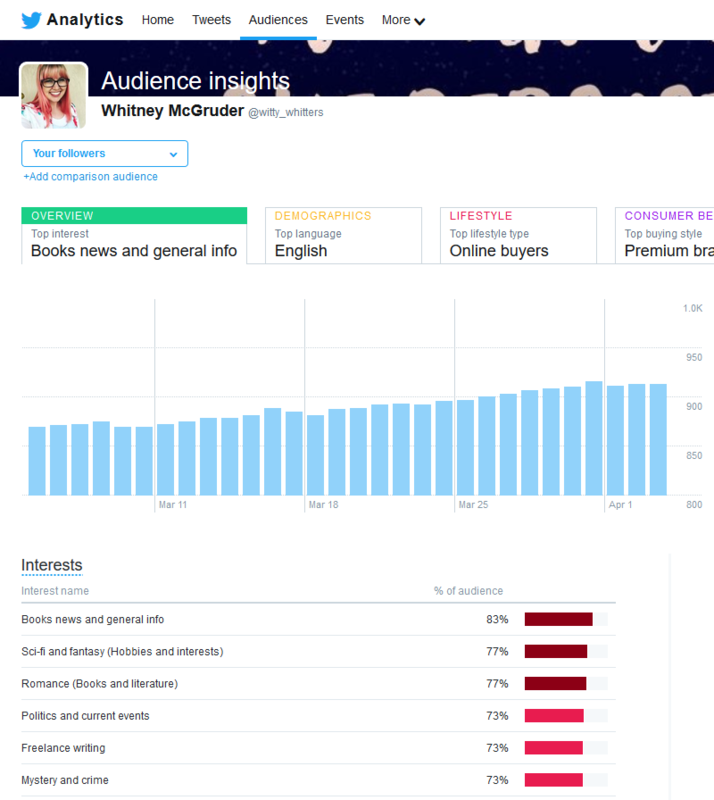 The “Audiences” tab gives you a breakdown of your followers. This can teach you about topics your followers like and thus give you topic ideas for future content. Then, try comparing your followers and your organic audience (the people who do more than click “Follow”) to see what your people truly enjoy tweeting about. Finally, check out the “Events” tab. There you’ll find what your current audience will likely tweet about in the coming months, such as upcoming movies, holidays, celebrations, and more. Use this information to plan future hashtags or topics your viewers will likely respond to. Facebook insights give you insights similar to those in Twitter analytics but with some added helpful features. Note that these insights are for Facebook pages, not your personal profile. Find this information by heading to your Facebook page via a computer; then click on “Insights” at the top just under the search bar. Next, click on “Post Types” in the horizontal column just above the stats. This shows which posts gets the most attention, whether it’s a video, link, status, or photo. With this information, decide which formats your viewers like the most. Just below that, see which posts get clicks. If you’re curious about which blog posts pique your readers’ interests, see which posts garner the most clicks as opposed to reactions. Reactions means if they leave a like, love, wow, etc. Once you know which posts get reactions versus clicks, you can learn which specific types of posts keep people on your page and which posts get them to your website and turning into potential clients or fans. Finally, explore Google Analytics. It provides some pretty valuable information about your actual blog that you might not get if you don’t have analytic information through your blog platform itself. First, sign up for Google Analytics via analytics.google.com. You’ll basically connect your website to Google so it can start analyzing your site. This will only officially happen if you install a plugin to your blog to establish that connection and give Google permission to analyze your site. I currently use “Google Analytics Dashboard for WP” (GADWP), but you can choose from many different plugins. The main differences will be the interface, but if the plugin has a good rating, it’ll do the job. I recommend setting up Google Analytics and then downloading your plugin of choice. Then let Google track your stats for at least a month. That way you‘ll have some helpful stats to work with. There’s a graph right on the homepage that shows how many people interact on your blog by the day of the week and the time of day. This can help you decide which day or time works best if you want to reach more people. For example, the majority of my followers visit my blog between 8:00AM–3:00PM on Mondays, Wednesdays, Thursdays, and Saturdays. Below the graph, your analytics will show how your viewers find your website. Google Analytics divides this information by social media, direct (they subscribe to your blog), and organic search (they googled your site). If you click “Source/Medium,” the graph shows more specific information about which social media platform is the most effective. You may be surprised what you’ll discover. While it’s great to be available on a lot of social media platforms, it’s ideal to know which platform does the most good. If you need to cut down on social media, you’ll find the weakest link. Google Analytics will probably give you more information than you asked for, so I recommend checking out all the available reports on the left-hand side of your screen. I hope the next time you feel burned out with your blog you’ll realize that it’s easy to figure out the next steps on your own. In the meantime, do you have more questions about analytics and how to interpret your stats? Share your questions in the comments so we can help each other out. Whitney currently works as a content editor & support member for Boostability & WritersDomain. When she isn't freelance editing or working on her novels, she can be found cooking Danish food, cross stitching, Zumba dancing, and collecting Funkos. Find her on Instagram as @whit2ney and on Twitter as @witty_whitters.